We are excited for the opportunity to introduce kids from all backgrounds to the fun, positive, character-building aspects of tennis while creating business ownership and job opportunities in the industry. TGA, the company that is introducing golf to thousands of children nationwide through programs at schools and community based organizations, is set to do the same for tennis in partnership with the United States Tennis Association (USTA). This month the innovative youth sports franchise company will begin awarding franchises for its newly minted TGA Premier Youth Tennis, modeled after its successful eight-year-old TGA Premier Junior Golf program that is now in more than 2,500 schools, reaching upwards of 177,000 students in 23 states. As with the golf program, the youth tennis franchises will create business ownership opportunities for motivated self-starters who are passionate about tennis, and job opportunities within communities for people who enjoy working with children. At the same time these individuals will change the landscape of growing tennis. The TGA/USTA partnership aligns with USTA’s youth initiative, 10 and Under Tennis, which is geared towards getting more kids to participate in tennis using modified equipment and courts tailored to a child’s size and age. Together they have developed curriculums for K - 3rd grade and 4th – 8th grade, enriching kids’ lives through physical fitness, health and nutrition, education, and character building. Steve Tanner, chief operating officer of TGA Premier Golf and Tennis, who oversees separate tennis and golf franchises, along with joint tennis-golf franchises, said the blueprint for tennis franchises would be the same as golf. TGA is expected to attract tennis industry professionals, as well as business professionals to develop TGA tennis franchises. Some owners of golf franchises, who wanted to expand their existing business, have already begun snapping up the first tennis opportunities TGA made available. Jacobs and Tanner are optimistic on the potential for growth and success for the in school tennis model. They said tennis will adapt to a school setting very easily using the modified equipment developed by the USTA. TGA Premier Youth Tennis (TGA) is a youth development program executed through a unique franchise opportunity for self-starters who enjoy working with children in a business venture that provides entry into youth sports, education, and the tennis industry. TGA introduces youth to tennis at elementary and middle schools, child care centers, and community based organizations, through a multi-level enrichment program before transitioning them to camps, clinics and leagues at local tennis facilities nationwide. TGA is a national supporting organization of the Afterschool Alliance and Lights on Afterschool and is a corporate advocate and national partner of the President’s Challenge on Physical Fitness, as well as the National Council of Youth Sports. 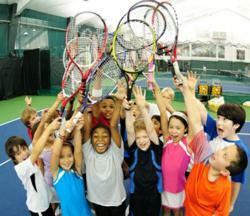 For more information on TGA, visit http://www.playtga.com or follow @tgayouthtennis on Twitter.